Indie Retro News: The Dawn of Kernel - A high quality Amstrad CPC game is coming 21st August! The Dawn of Kernel - A high quality Amstrad CPC game is coming 21st August! Juan J. Martínez (Reidrac) is no slouch when it comes to retro gaming development. As he has created some fabulous games in the past such as Escape from Colony 8, Space Pest Control, The Legend of Traxtor, The Return of Traxtor and Castaway for the ZX Spectrum. As well as Rescuing Orc for the C64 and Magica and Golden Tail for the Amstrad CPC. 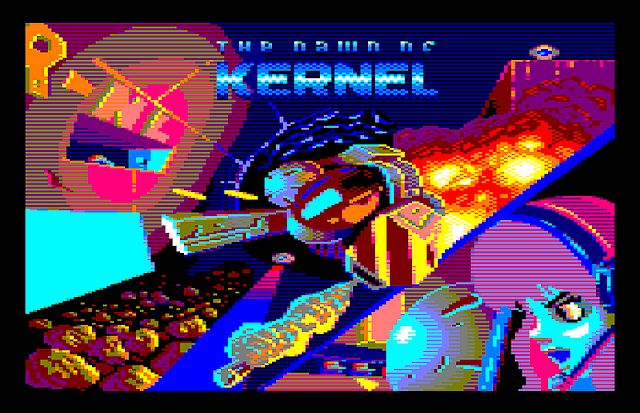 Well it looks as if the developer isn't taking any time off, as after a more recent tweet he's back to the Amstrad CPC and making an incredible looking game called 'The Dawn of Kernel' which is due to be released 21/08/2018! As noted by our previous write up, Juan J. Martínez (Reidrac) is working on the code, graphics and audio, whereas Dylan Barry (@ASIC0541) is doing the intro and loading screens. He also told us previously The Dawn of Kernel will have obvious influences to the Cybernoid series, as well as gravity and thrust additions, but also differences to Cybernoid in that it won't be a frantic shooter but a tactical one, with some puzzles and a large map to navigate.